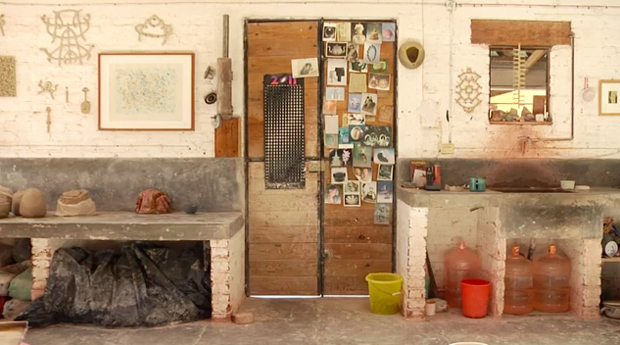 It’s almost two weeks to the day now that I brought across the collection of Mexican ceramic artist Gustavo Perez so it was quite a welcome coincidence to see him pop up again today in this delightful short film. The last piece I posted on Gustavo was centred around the exhibition currently taking place at Erskine Hall and Coe gallery in London, in contrast to today where this project highlights Mr Perez getting his hands dirty in the studio. We do try to offer the full artistic circle where possible so it’s great when the missing parts of the jigsaw slot into place. If you enjoyed the previous collection we shared you’ll be pleased to know that this video showcases many of the final pieces from before, just in an earlier state. Those amongst us that don’t speak Mexican (me included) won’t be able to decipher the exact conversation of the artist in the video below, but in all honesty I don’t think this matters an awful lot as this is very much based around the actual creation. Perhaps more than your traditional potter Gustavo is quite a captivating creator to watch as he’s very open to experimenting with form, leading in for lots of alternative techniques on show. His studio is quite picture-esk in places too with the greenery outside bringing in a little character and colour through the windows. I hope you all enjoy this piece here as much as I have, finally I must note if you are in London area from today to the 5th of April you can see a glimpse of Gustavo Perez’s work on show at Erskine Hall and Coe Gallery in Piccadilly. Watch on below and enjoy!